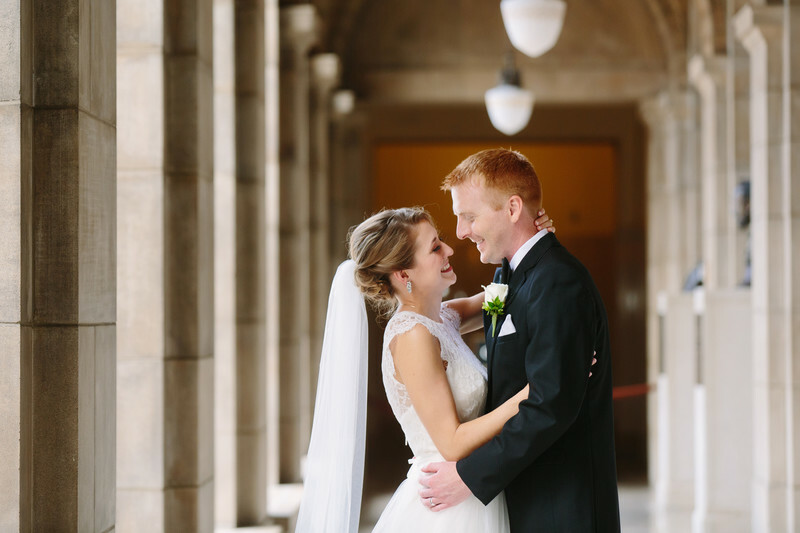 Tony and Katie were married at The Newman Center on campus at the University of Nebraska. It was extremely hot on their wedding day (over 100 degrees) and so outdoor photos for an extended period time were not really an option. Thankfully the Nebraska State Capitol is an amazing option in case of weather where it is too hot, too cold, or raining. It's even great on days with perfect weather. Shooting at the Capitol has a lot of rules and requires permission in advance, but I am very familiar with their requirements and have a good relationship with the office that handles requests for photo sessions. It is very important that anywhere you shoot you are respectful and follow the rules as the opportunity to use such a beautiful space is most definitely a privilege. The gallery hallways just off of the rotunda are a favorite spot in the building as they are full of natural light and the decor is very subtle and muted. While many other areas in the building are also gorgeous, the decor is much more ornate. Location: Nebraska State Capitol, 1445 K Street Lincoln, NE 68508.